Community-based research (CBR) is a powerful pedagogical tool for actively engaging and empowering undergraduate students in their research endeavors. This chapter explores how CBR facilitated undergraduate researchers' transformative learning and the development of their civic skills when collaborating with alternative schools. Using the undergraduate researchers' reflections, focus group interviews, and a survey, this case study reveals how developing relationships with young, underserved community members was essential in changing their perspectives regarding the educational system and themselves. Furthermore, the undergraduate researchers' obstacles in collaborating with the community and within their team cohorts became critical sources of civic learning. The challenges of working with various partners fostered their capacity to navigate ambiguity, develop flexibility, and determine which experiences to communicate to community partners. CBR compelled the undergraduate researchers to maneuver through the unforeseen challenges of real life collaborations. In this fast-changing world, “college success” requires students not only to earn a degree but to thrive and deliver in a highly demanding, diverse, and global community (Kuh, 2008). Policymakers, educators, and the public are concerned that college graduates may not be prepared to be civically engaged in their communities or be able to collaborate with others from diverse backgrounds in a socially and emotionally skilled manner (Deardorff, 2009; Willis, Peresie, Waldref, & Stockmann, 2003). Compared to previous generations, millennial college students are exposed to more cultural individualism—from TV shows, music lyrics, and language use--, and have a more pronounced self-focus (Twenge, 2014). This individualistic trend conventionally leads to less empathy and concern for others (Reynolds & Branscombe, 2014). Consequently, millennials may have difficulties earning workplace respect and credibility from generationally different co-workers who hold negative perceptions of them (Myers & Sadaghiani, 2010). A national survey found that 30-47% of employers described college graduates as unprepared in their global knowledge, writing, critical thinking, and adaptability skills (Kuh, 2008). It is within such a context that over the last years, higher education institutions have displayed growing support for service-learning and community-based research (CBR) (Polanyi & Cockburn, 2003; Sclove, 1997). The literature on service-learning, which does not include CBR, has shown reasonable evidence that when service-learning is embedded in the course curriculum—and the service is well developed and implemented in the community—it has positive effects on students’ academic learning outcomes. It improves their development of new perspectives on social issues, and facilitates a greater tolerance and ability to work well with different individuals (Eyler & Giles, 1999; Swaner & Brownell, 2008). Historically, underserved students have been less likely to participate in community engagement practices despite deriving just as much benefit, if not more, than mainstream students (Kanwischer, Lilgreen, & Saralampi, 2015; Kuh, 2008). This chapter explores the role of CBR in engaging undergraduate students in the community through encouraging civic engagement and enhancing their research skills. It aims to expand on the sparse literature regarding the role of CBR in students’ learning, and the role of diverse communities in fostering the aforementioned skills (Lichtenstein, Tombari, Thorme, & Cutforth, 2011). 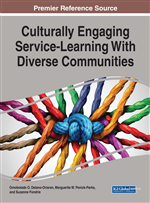 To support underrepresented students’ involvement in community engagement practices, this chapter focuses on the learning experiences of twelve undergraduate students who participated in a CBR course between their university and four alternative schools. The undergraduate students were considered underrepresented based on their self-identified statuses of being first-generation college students, students of color, or having low socioeconomic status. The four alternative schools of the CBR project served Somali students, adult learners, or students who had not been successful in traditional public school settings. This chapter employs a case study design with a twofold objective: to explore what characteristics of CBR are the most powerful in explaining undergraduate researchers’ learning; and how, specifically, CBR fosters undergraduate researchers’ transformative and civic learning (Mezirow, 1978; 1991)—which are generally defined as a shift in previously taken-for-granted assumptions and beliefs, and the capacity to work in a diverse community respectively. In addition, to illustrate the benefits of collaborative research among underrepresented students, this chapter is Co-authored by a faculty member and two of the underrepresented undergraduate researchers who participated in the CBR course.